Deflecto-o offers plastic floor registers, a variety of air deflectors and wall/ceiling registers. Made completely out of plastic, Deflect-O vents will not rust or corrode! 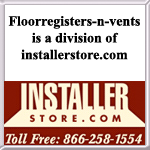 These white floor registers feature a vertical, contemporary look and will diffuse the airflow in your home. Buy them today for your bathroom or kitchen floors! These Deflect-o plastic floor registers can be used in both indoor and outdoor applications. Our brown vents will diffuse air up and have a easily adjustable damper. Click or call to order yours! This clear wall register air deflector adjusts to fit a 10" to 16" sidewall vent. Redirect air flow up and into your room or flip cover down to direct air down the wall. This product won't rust! Our premium floor register deflector is crafted out of clear plastic which will not rust. This Deflect-o air flow deflector will move air up and into the room instead of straight into the ceiling. Redirect air conditioner flow up and into your room instead of leaving it at floor level. These AC vent flow deflectors will force your air to go upwards. This plastic cover fits on floor register measuring 10 to 14 inches. This adjustable register air deflector is made for your floor vents and comes with a detachable filter! Clean your air while redirecting airflow from your vents all at the same time. Order now! When using this Deflect-o baseboard air deflector, you will redirect air into your room and not up to your ceiling. This product can adjust between 15" to 25". For longer extension, use with Model No. #67 which is our extension sleeve. Use this extension sleeve on Model #52 or #53 to extend your air deflectors by an additional 12"! This plastic air sleeve slips right into the air deflector and will traffic the air out from behind furniture. These are a perfect for use on walls or ceilings in areas with high humidity. The Deflecto plastic wall/ceiling register is light weight and easy to install.